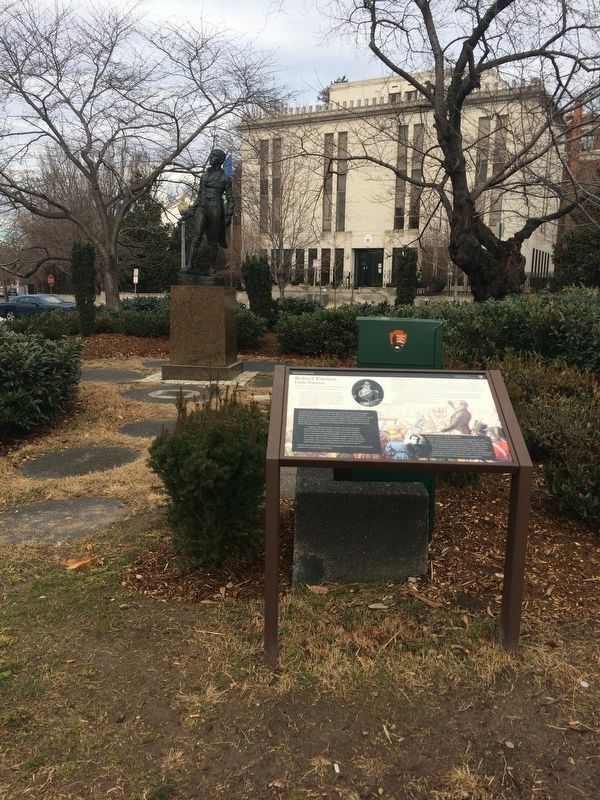 "I wished to procure for my country the guarantee which Washington procured for America"
The centerpiece of this small park is a sculpture of Irish patriot Robert Emmet that serves as a tribute to how American democracy inspired the independence of Ireland. Emmet, born in Dublin in 1778, was strongly influenced by the American Revolution. Educated at Trinity College Dublin, Emmet was remembered by contemporaries for his oratorical brilliance. travailed. Let no man attaint my memory by believing that I could have engaged in any cause that of my country's liberty and independence...Let no man write my epitaph. When my country takes her place among the nations of the earth, then and not till then, let my epitaph be unwritten." Emmet was executed the next day, on September 20, 1803. His stirring words continue to inspire Irish patriotism. 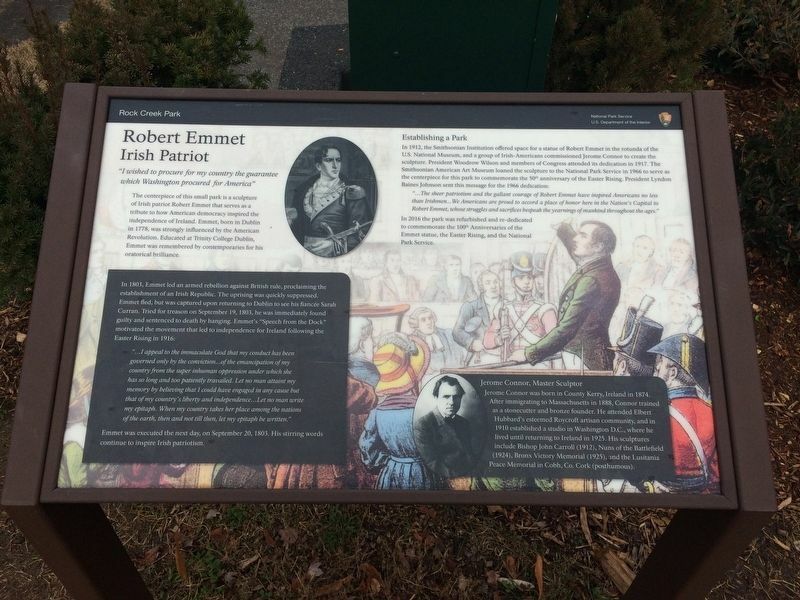 "...The sheer patriotism and the gallant courage of Robert Emmet have inspired Americans no less than Irishmen...We Americans are proud to accord a place to honor here in the Nation's Capital to Robert Emmet, whose struggles and sacrifices bespeak the yearnings of mankind throughout the ages." In 2016 the park was refurbished and re-dedicated to commemorate the 100th Anniversaries of the Emmet statue, the Easter Rising, and the National Park Service. Jerome Connor was born in County Kerry, Ireland in 1874. After immigrating to Massachusetts in 1888, Connor trained as a stonecutter and bronze founder. He attended Elbert Hubbard's esteemed Roycroft artisan community, and in 1910 established a studio in Washington D.C., where he lived until returning to Ireland in 1925. His sculptures include Bishop John Carroll (1912), Nuns of the Battlefield (1924), Bronx Victory Memorial (1925), and the Lusitania Peace Memorial in Cobb, Co. Cork (posthumous). Erected 2016 by National Park Service, U.S. Department of the Interior. Location. 38° 54.83′ N, 77° 3.164′ W. Marker is in Sheridan-Kalorama, District of Columbia, in Washington. Marker is on 24th Street Northwest north of Massachusetts Ave Northwest, on the left when traveling north. Touch for map. On the grounds of Emmet Park. Marker is at or near this postal address: 2349 Massachusetts Avenue Northwest, Washington DC 20008, United States of America. Touch for directions. Other nearby markers. At least 8 other markers are within walking distance of this marker. Robert Emmet (here, next to this marker); Kalorama (a few steps from this marker); St. Jerome the Priest (within shouting distance of this marker); Jeju Dol Hareubang / 제주 돌 하르방 (within shouting distance of this marker); Woodrow Wilson House (about 300 feet away, measured in a direct line); Joel Barlow (about 700 feet away); Simón Bolívar (1783-1830) (about 700 feet away); Dr. Philip Jaisohn, 1864-1951 (about 800 feet away). Touch for a list and map of all markers in Sheridan-Kalorama. More. Search the internet for Robert Emmet: Irish Patriot. Credits. This page was last revised on March 23, 2019. This page originally submitted on January 13, 2018, by Devry Becker Jones of Washington, District of Columbia. This page has been viewed 86 times since then and 11 times this year. Photos: 1, 2. submitted on January 13, 2018, by Devry Becker Jones of Washington, District of Columbia. • Bill Pfingsten was the editor who published this page.